Thursday night, at the Moat House, Festival Park, Stoke, Paul Dykes promoted a dinner show which featured three contests. 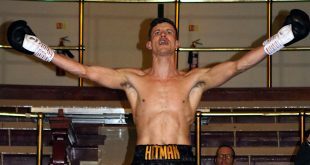 Headlining the bill, Rob Hunt of Stafford faced Ben Lawler of Skegness for the British Masters Welter-weight Title, but it wasn’t to be the Stafford mans night! Hunt has a disastrous start which sees him down in the first round. Lawler was encouraged by the knockdown and his trainer Carl Greaves shouts “Believe in Yourself!” from the corner. The Stafford man goes down again early in the second round, but there were some hefty head shots flying in from both men – either one could have hit the canvas! But it was Hunt again who took a second count. 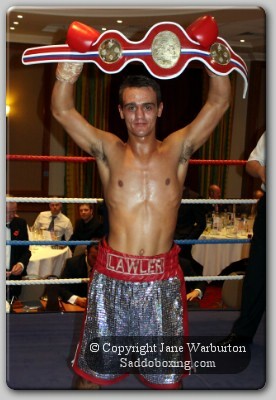 Llewellyn ‘The Blessed’ Davies entered the ring wearing a scarf around his face ! The Southpaw from Oliver Harrisons gym got straight to work in the first round, delivering a number of solid body-shots to the torso of Brook who’s nose was bloody by the end of the opener and he looked ‘winded’. Davies continues with the body-shots in to the second frame. The third sees Brook pressured in the neutral corner under a barrage of head-shots resulting in the stoppage by Referee Terry O’Conner. 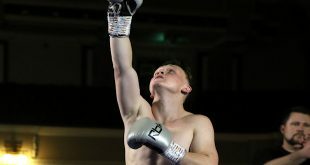 Popular Debutant – Andy Keates from the Impact Boxing Gym, Fenton, notched up his first pro-win against Carr. A testing first contest for Keates who sustained a cut to the right eye in round two. 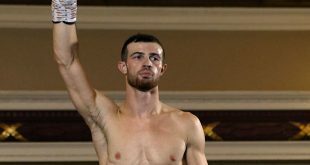 He kept focussed - brushing his opponent aside when he lunged in low - and though pressured in the fifth round briefly, secured a 59-56 points victory. 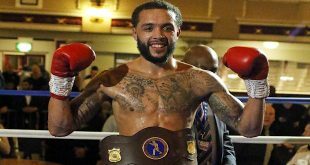 Previous Boxing Perspective: Can Audley Dethrone Haye For WBA Title?